Dr. Tenpao Lee, dean of Niagara University’s College of Business Administration, far left, and the Rev. James J. Maher, C.M., NU president, far right, presented awards last night to Robert Denning, president and CEO of Perry’s Ice Cream; Sundra L. Ryce, president and CEO of SLR Contracting & Services Co.; Robert J. Travis, ’77, co-founder of Chiampou Travis Besaw & Kershner LLP; Jim Fashano, president of Alliance Advisory Group; and Minh Tran, founder of Tran Global International. 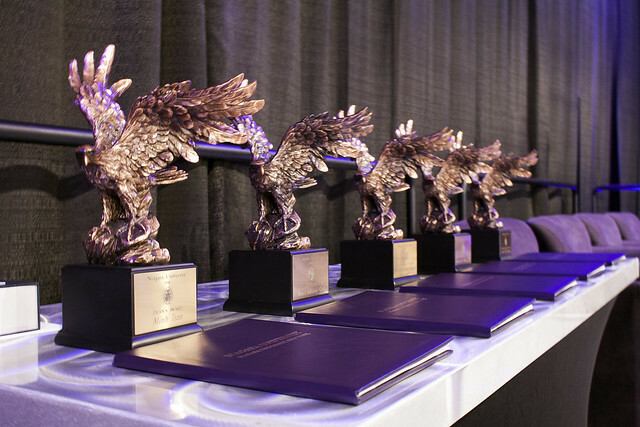 Niagara University’s College of Business Administration recognized five area business leaders during its 28th annual Business Appreciation and Accounting Banquet, held April 30 at the Conference Center Niagara Falls. The AACSB-accredited college honored Perry’s Ice Cream (Corporate Leadership Award); SLR Contracting & Services Co. (Family Business of the Year); Robert J. Travis, ’77 (Distinguished Accounting Alumnus); Minh Tran (Dean’s Award); and Alliance Advisory Group (Business Appreciation Award). In addition, Niagara University also saluted Myriam Witkowski for her more than 40 years of service, much of it in the College of Business Administration. Witkowski retired after the 2017-2018 academic year. More than 240 people attended the awards banquet. Perry’s Ice Cream received the Corporate Leadership Award in the midst of its 100th anniversary celebration. Started when H. Morton Perry purchased a dairy farm in Akron, N.Y., the fourth generation of the Perry family is ensuring that Morton’s same commitment to quality and community is continued. The company now offers more than 500 unique items in over 30 countries. Perry’s employs nearly 400 team members and has expanded to its current location at One Ice Cream Plaza. The current generation of Perrys is continuing its great-grandfather’s commitment to the community. Nearly 100 percent of the milk used in their ice cream production comes from farms within 50 miles of Akron, and, since 2010, the company has donated more than $750,000 to charitable organizations, including the Akron Business Council, the Akron Community Lions Club, Camp Good Days, the Food Bank of WNY, and the United Way. Through the Perry’s Returns to the Community Program, team members can support their favorite charities. The Family Business of the Year Award went to SLR Contracting & Services Co., which was founded by Sundra L. Ryce in 1996. The full-service general construction and construction management firm generated $178,000 in revenues in its first year. Today, SLR regularly executes multimillion dollar contracts. In the past few years, SLR has completed projects totaling more than $26 million for Buffalo City Schools, a $17.4 million new office and warehouse for the New York Power Authority, and $10.4 million worth of work for the State University Construction Fund. Due to SLR’s enormous success, Ryce has appeared on the cover of Black Enterprise magazine for its “Rising Stars 40 & Under: The Next Generation of Women of Power” issue and been featured in Ebony and Essence magazine issues profiling women of power. She has served in board roles with the Buffalo Zoo, the Buffalo Niagara Partnership and the Buffalo State College Foundation Board, among others. The 2018 Distinguished Accounting Alumnus was Robert J. Travis, ’77, who began his career with Touche Ross, which later became Deloitte & Touche. He was promoted to audit partner in 1990 and, four years later, launched his own firm, Chiampou Travis Besaw & Kershner LLP. Today, it is one of the largest CPA firms in Western New York. Travis works with major corporations and high net-worth individuals in the Western New York area, and with the U.S. Department of Justice on Chapter 13 and Chapter 7 audits. He is a member of the New York State Society of Certified Public Accountants, the American Institute of Certified Public Accountants, and the Association of Certified Fraud Examiners. Inspired by Niagara University’s Vincentian tradition, Travis created and spearheads his firm’s Helping Hands volunteer group. He also offers his time in leadership roles for Catholic Health System, the Niagara Community Center, Our Lady of Peace Nursing Home, St. Peter’s Parish and the Niagara Falls Boys & Girls Club, among others. Minh Tran, the 2018 Dean’s Award recipient, made his way from Vietnam to Buffalo in 1980 without knowing much about American culture or the English language. Tasked with providing for his family, he began working at M. Wile and Company. After putting in long days at the garment factory, Tran would learn English at night. He then served as a case worker at the International Institute of Buffalo, helping refugees to settle in their new homes. In 2005, he established Tran Industries and secured a lucrative contract with Curtis Screw. In 1999, he opened 99 Fast Food, and, then in 2014, established Pho Dollar. Two years ago, Tran and his business partners signed a franchise agreement to open an Anchor Bar location in Amherst. He also owns a Save–A–Lot supermarket in the city of Buffalo. Tran now spends a great deal of time in Vietnam working on an importing-exporting business venture he created called Tran Global International. Alliance Advisory Group received the Business Appreciation Award for its focus on building alliances – within its team of associates, amongst its clients and throughout the community. Led by Chairman and CEO Bob Fashano and his son, Jim, who serves as president, Alliance Advisory Group supports and encourages mentoring and coaching. Headquartered in Buffalo, with additional locations in Rochester, Syracuse and Jamestown, Alliance is among the region’s largest independently owned financial services firms. The firm offers a full range of investment, insurance, estate planning, business continuity and retirement services. Alliance supports numerous community organizations, including Roswell Park Comprehensive Cancer Center, the Salvation Army, the National Center for Missing and Exploited Children, Habitat for Humanity, and many others. Last July, Niagara University and Alliance expanded their partnership when the former began offering graduate business courses at the latter’s location in downtown Buffalo. To date, 125 students have already taken MBA and finance courses there. Corporate sponsors of this year’s banquet were Alliance Advisory Group, Catholic Health System, Chiampou Travis Besaw & Kershner LLP, Citi, Computer Task Group, Dopkins & Company LLP, Lumsden & McCormick LLP, M&T Bank, Niagara University’s Family Business Center, Perry’s Ice Cream, Supply Chain Optimizers and The Bonadio Group. For more information on Niagara University’s business programs, please visit www.niagara.edu/business.